Chicken caesar salad is one of my favourite dishes to treat myself to at a restaurant, however up until now I had never actually tried to make myself. This recipe is ridiculously quick and easy to make and a million times more flavourful than any of the shop bought caesar dressings you can buy, so there is now no excuse for me to keep this dish as a restaurant only indulgence! 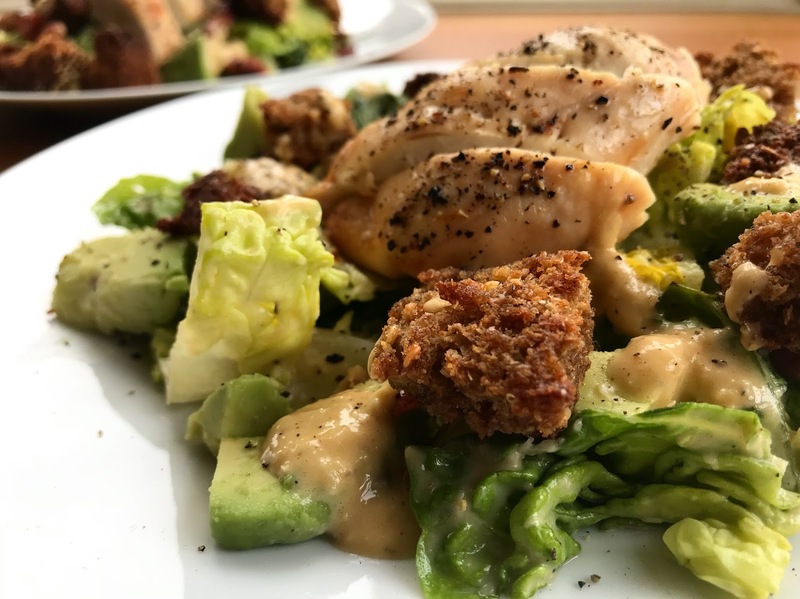 The combination of the crisp chicken, smooth avocado, crunchy lettuce, bacon and croutons and silky garlic dressing is an absolute marriage made in heaven. P.S. Add anchovies according to taste...I personally don't like them whole, however feel free to add them in as your taste so desires! Begin by preheating the oven to 200 degrees / gas 4. Place the chicken on a lined baking sheet with salt and pepper and place in the oven for 25 minutes until nicely golden. Place the diced bread on another lined baking tray with the olive oil, rosemary and plenty of salt and pepper. Toss everything together so that the oil evenly coats the bread and bake for 10-15 minutes crisp. Leave to cool. Fry off the bacon lardons until nice and crispy. In the meantime, make the dressing by adding the anchovies, lemon juice, egg yolks, lemon juice and mustard to a food processor. Pulse a few times so that the anchovies start to break up. Then keep the blender running and drizzle in the olive oil so that the dressing thickens slightly. Pour into a small bowl and mix through the cheese. Add the lettuce leaves to a large mixing bowl and using your hands gently mix through 3/4 of the dressing, ensuring the leaves are evenly coated. Plate the lettuce then top with the avocado, bacon, sliced chicken and croutons. Top with plenty of pepper and enjoy!